We're super excited to share that we were voted top salon in Northern Virginia Magazine! What a great way to start the new year! Thanks to all the happy clients that voted! "For over 10 years, Salon Virage has carved out its hair expertise in the Falls Church area. The salon offers color services such as color correction, highlights and bayalage; haircuts; and a number of hair treatments. Such treatments include Keratin, fantasy coloring, Olaplex, PHYTO and deep conditioning. Salon Virage also uses Invisitab hair extensions, which were named Best Hair Extension by New York Magazine and created by celebrity stylist Ron King. Citing customer service as their highest priority, the stylists at Salon Virage strive to make their customers comfortable with an upbeat and energetic salon atmosphere. 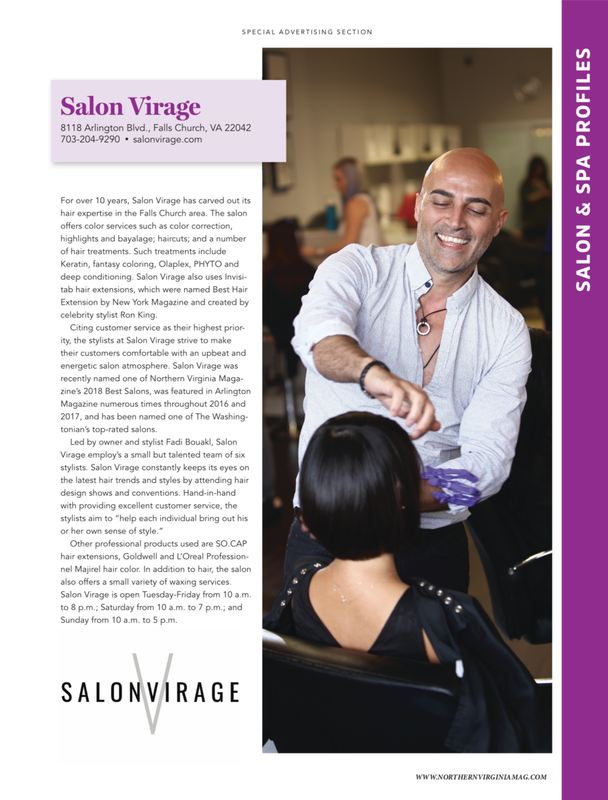 Salon Virage was recently named one of Northern Virginia Magazine’s 2018 Best Salons, was featured in Arlington Magazine numerous times throughout 2016 and 2017, and has been named one of The Washingtonian’s top-rated salons. Other professional products used are SO.CAP hair extensions, Goldwell and L’Oreal Professionnel Majirel hair color. In addition to hair, the salon also offers a small variety of waxing services. Salon Virage is open Tuesday-Friday from 10 a.m. to 8 p.m.; Saturday from 10 a.m. to 7 p.m.; and Sunday from 10 a.m. to 5 p.m."